June 11, 2015 Fact of the Day: Which group of Millionaires enjoy investing? DID YOU KNOW THAT MILLIONAIRES GENERALLY ENJOY INVESTING LESS AS THEY GET OLDER? In recent research conducted by Spectrem Group, 48 percent of Millionaires over the age of 65 indicated that they like to be actively involved in the day-to-day management of their investments. Forty five percent indicated that they enjoy investing. 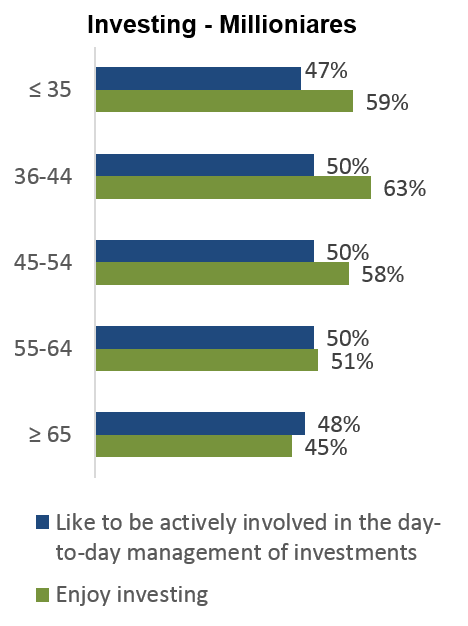 In contrast, 47 percent (a slightly lower amount) of those under the age of 35 like to be involved in the day-to-day management of their accounts. Fifty percent of those from the ages of 36-64 like to be involved in the day-to-day management of their accounts. But despite the fact that these investors like to be involved…many of them also enjoy investing. Unlike the 45 percent of those over age 65 who enjoy investing, 59 percent of those under age 35 enjoy investing. 63 percent of those between the ages of 36-44 enjoy investing and 58 percent of those between the ages of 45-54 enjoy investing. The fun starts to dissipate to 51 percent for those between the ages of 55-64.